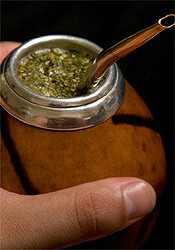 An easy answer will be to describe it as the container that holds an infusion that argentines call...a mate. Confused ? 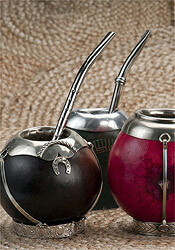 Well, both the container and its drink carry the same name so whenever you ask for mate, you'll be given one...or both. 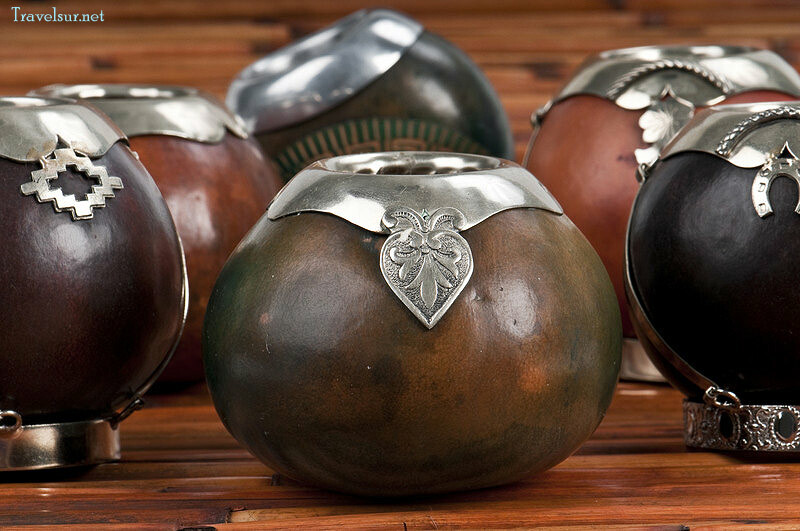 The little, hollow pumpkin, decorated sometimes with silver ornaments as if it were a piece of jewelry is actually much more than a drink for argentines (people from Uruguay and Chile have the same habit, in particular from Uruguay). 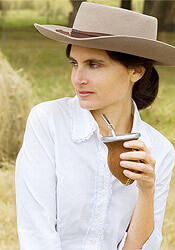 It is not only a social ritual, it is part of everyday's life for argentines. 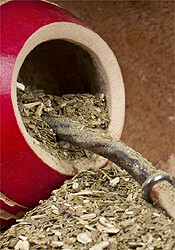 In essence, it is a tea brewed from a plant grown in the northeast called yerba. 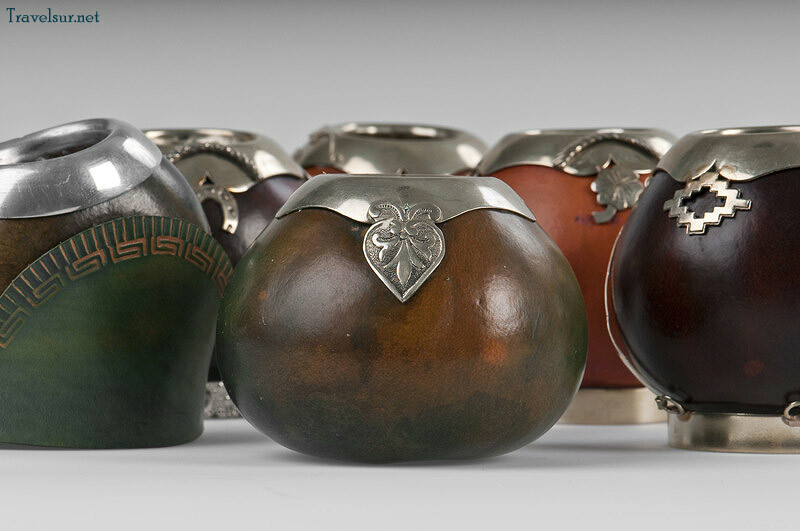 This bitter green tea is obtained by adding hot water to leaves held in a seasoned gourd (the 'mate' container). 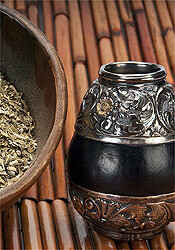 It is said to be an aid in mental alertness and to have general healing properties. Most commonly, it is known as a coffee alternative. 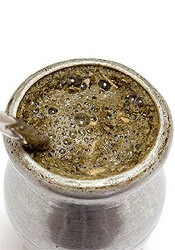 The gourd (mate) containing the brew is passed to each participant in a circle, who drains it through a metal straw (bombilla), before refilling it with hot water for the next participant. 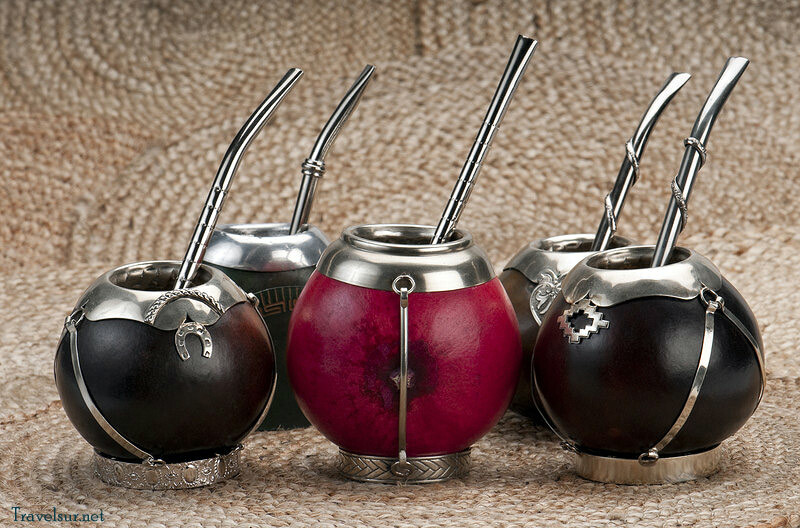 The mate will do several circuits before it is deemed washed out (lavado). 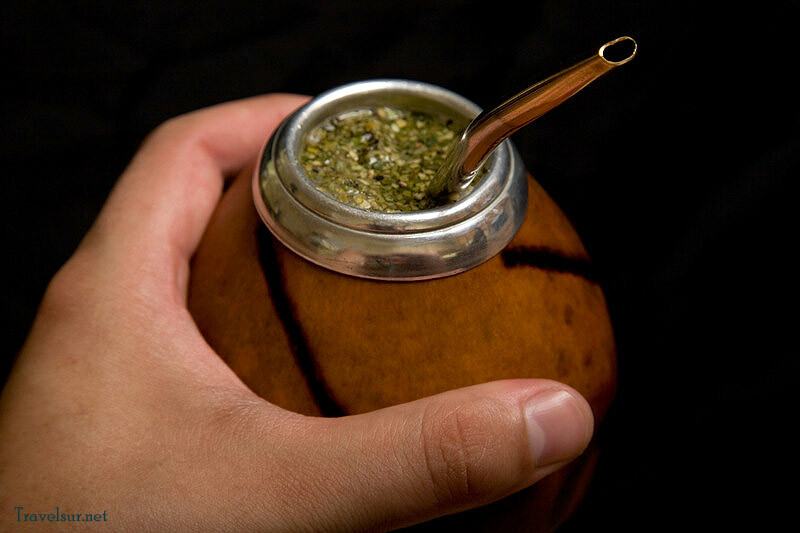 Then, someone usually adds more leaves and starts a new round of mate (the drink). If you are still confused, then, we recommend that the best will be to try the experience yourself. In Argentina, there will be plenty of opportunities for this. 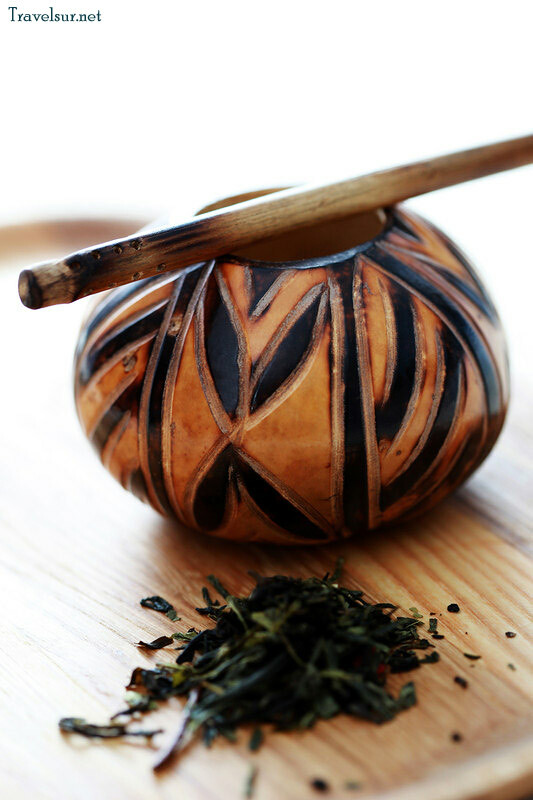 The main point is that the thirst-quenching properties of this home-brewed tea -said to help in weight loss control- are of secondary importance to its social role. Passing the mate around is a decorous ritual, a convivial part of life, not only in the countryside, but anywhere in the city. Even in airplanes throughout a trip!! It is about intimacy and friendship. It was during the viceroyalty of 'Rio de La Plata' -the Spanish colonization period- when Hernandarias, governor of Paraguay, observed that native indians would handle well the demands of the rigorous tasks imposed to them each day, much better than his own spanish troops. 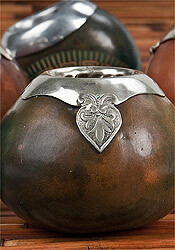 He soon discovered that natives were in the habit of drinking a tea made out of 'yerba silvestre caa'. Jesuits tried to ban the brew for they considered it addictive. But after they realized that natives would actually work more and better -it acted as a stimulator and body energizer- they abandoned the idea. In fact, they decided to start its massive cultivation as opposed to picking up the leaves in the wild. They studied the plant in-depth and it soon became a major crop in all of the 30 villages they were controlling. After Jesuits were expelled from the colonies and replaced by the religious order of Fransiscans the crops were somewhat abandoned but the demand never stopped and was actually satisfied by crops from other regions. Much later, in 1876, it was the state of Corrientes who issued reglamentation to regulate its production... and a whole industry was born. 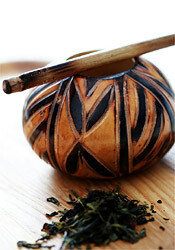 The infusion is not only drunk through a gourd, sometimes it is brewed just as a tea, and it is known as 'mate cocido'. It has become such a social symbol that not accepting a sip, provided you are in a typical 'mate setting', may be viewed strangely. Misiones today devotes 180,000 has (hectares) to its crop and Corrientes, in turn, devotes 21,000 has. 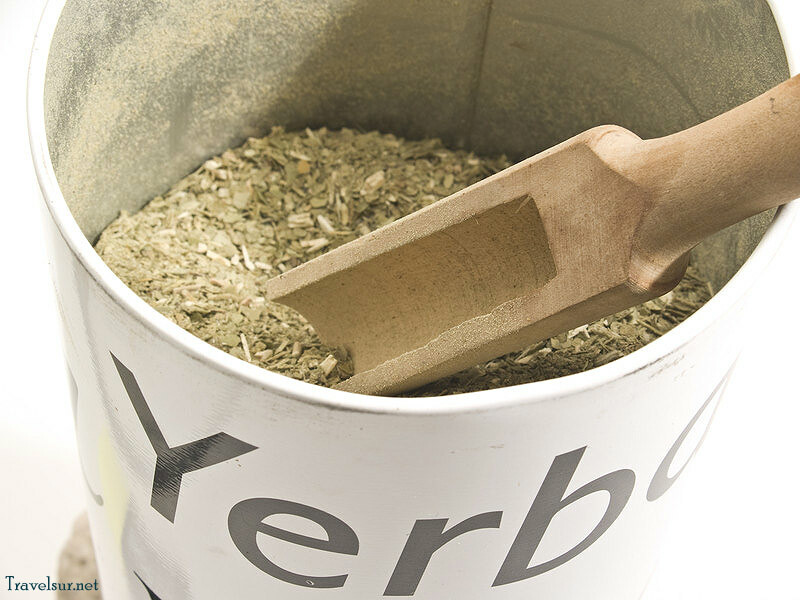 The herb has not only crossed south american borders, it has extended its reach globally and can be found in dozens of stores in the United States, specially where latinos live. 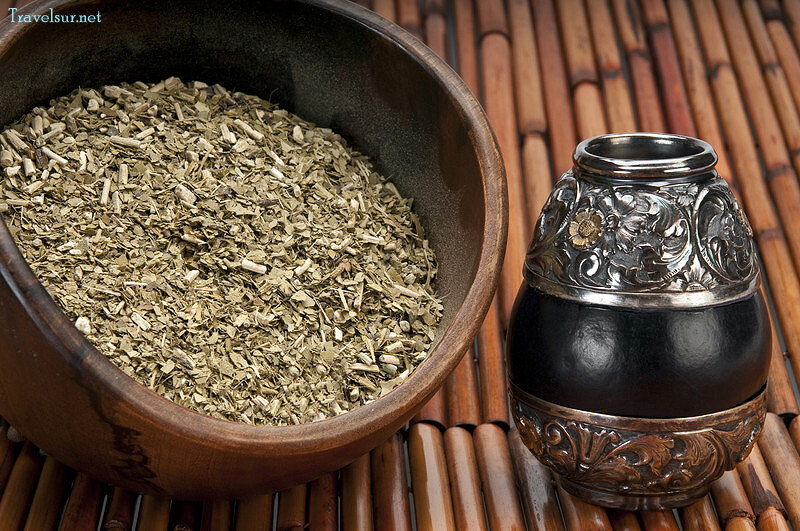 It has acquired a reputation for its healing properties, a therapeutic brew, an aid in colon cleanse and a body energizer. In general, it is an excellent coffee alternative. Other interesing links. 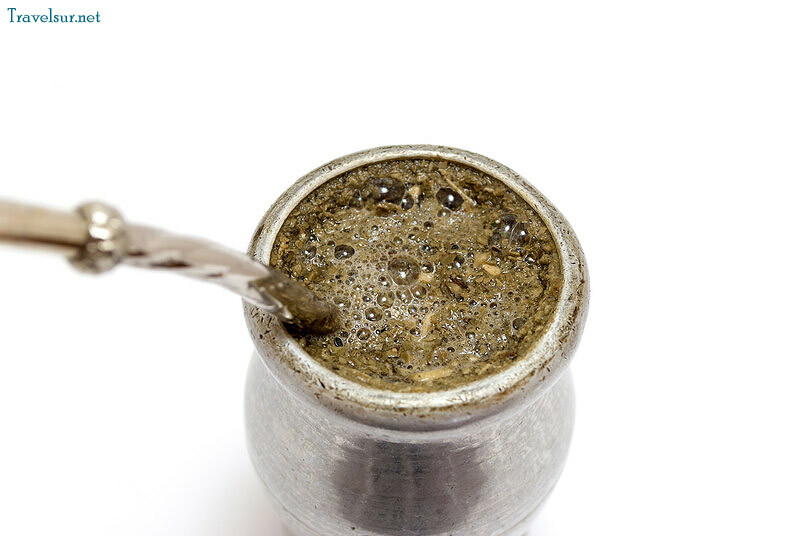 Aviva Yerba Mate: Our mission at Aviva is to responsibly cultivate, harvest, package, and distribute to our worldwide customers the finest quality from South America. 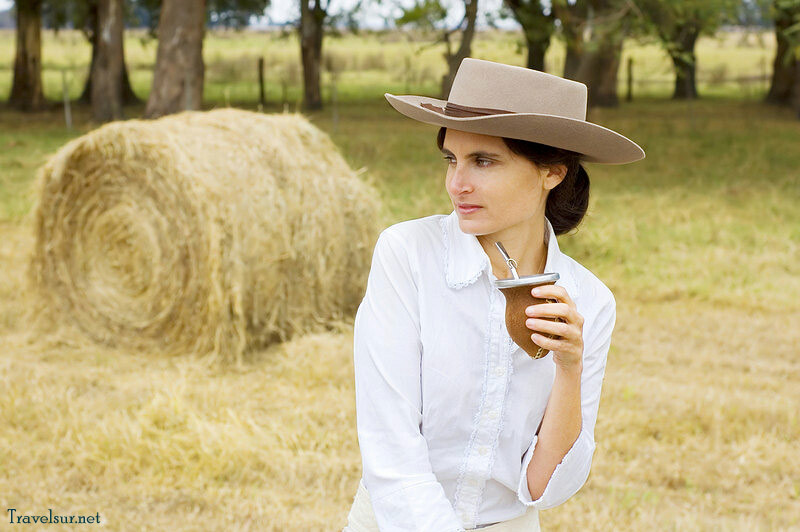 Like coffee and tea, tastes differ. The environment, growing conditions, and harvesting methods greatly affect conditions and potency of the infusion. To know more about this energizer tea visit our website. 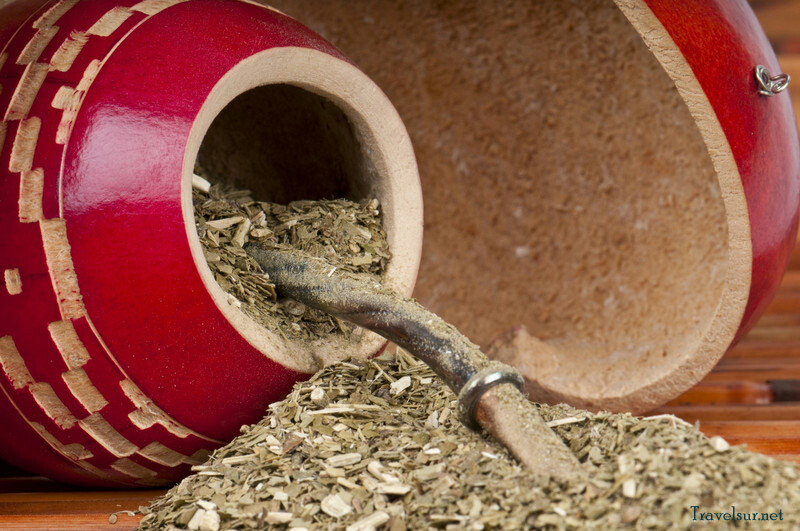 Other links about this: therapeutic brew.South American Herbal Tea: Our site is a one-stop shop for enthusiasts all around the world. We are proud to be the official and preferred online vendor of one of the most original and respected producers in the world, Establecimiento Las Marías, whose brands include: Taragüi, Unión, La Merced, and others. 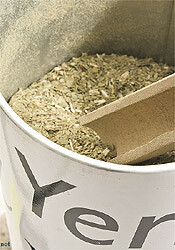 See a video at our site to learn more about its healing properties.